Zooming – You need a zoom lens to create this effect and the longer the zoom the better. The Nikon 28-300mm VR Zoom lens I use works great. It was a bright sunny day for this photo of a bright orange Pontiac GTO at ESTA Safety Park Dragstrip so I had to close down the aperture to f/22 to get a relatively slow 1/30th of a second shutter speed. I set my camera in burst mode and started with the lens at its 300mm focal length. While pressing down the shutter button, I zoomed the lens the entire range back to 28mm. This was one of the middle photos of the set. 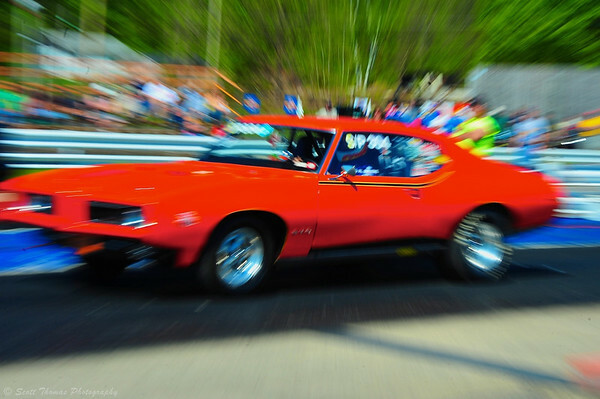 Zoomed photo of an orange GTO at the starting line at the ESTA Safety Park Dragstrip near Cicero, New York. Nikon D700/28-300VR, 1/30s, f/22, ISO 200, EV 0, Variable focal length. Blurring – You create a blur by using a long exposure relative to the motion of the subject(s) being photographed. Racing trucks create blurring at a shutter speed of 1/20th of a second when they take off as the starting lights flash green. Racing trucks take off during time trials at ESTA Safety Park Dragstrip photographed with a long exposure. Nikon D700/28-300VR, 1/20s, f/22, ISO 200, EV +0.3, 28mm focal length. Panning – You pan the camera smoothly to track the subject with a slow shutter speed while taking the photo. The idea is to keep the subject in sharp focus while the background turns into streaks of motion. 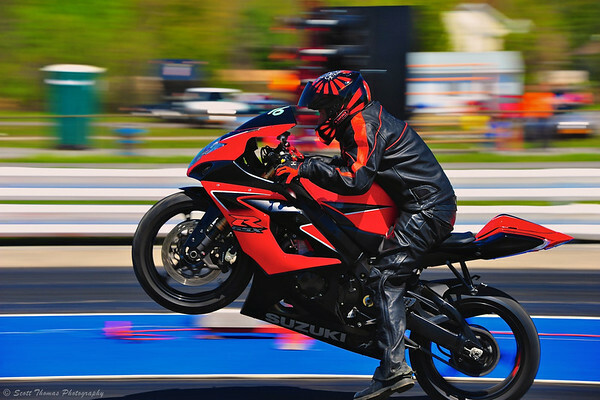 Panned photo of a motorcycle popping a wheelie at ESTA Safety Park Dragstrip. Nikon D700/28-300VR, 1/125s, f/8, ISO 200, EV +0.3, 135mm focal length. While happy accidents happen to everyone, the best motion photographs are made intentionally by the photographer. 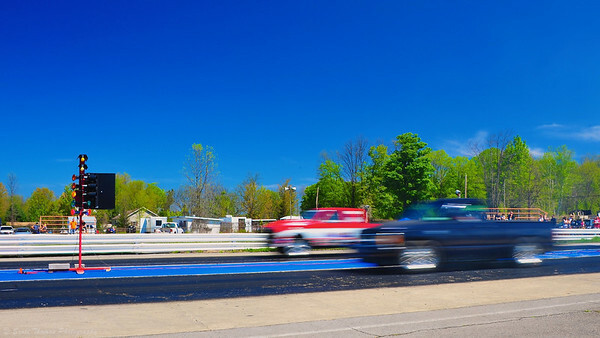 This entry was posted in Sports, Weekly View and tagged 28-300mm, blur, cicero, drag racing, dragstrip, esta safety park, gto, long exposure, motion, motorcycle, motorsports, new york, nikon D700, orange, panning, pontiac, vr, zooming. Bookmark the permalink. My favorite is panning. It took me a while to learn but well worth it. It is the hardest kind of motion photography to master. I still find it very challenging and fun to do. The motorbike photo is really good! Thank you, Birgitte! I do like how it came out. It was the best of the day, in fact. Great panning shot, love that GTO! I had a friend in high school that had one. While it looks like it had some body work done, it was my favorite car at the track. I have seen some beauties at the big annual Syracuse Nationals car show in the past. The Judge is a great version of the GTO muscle car. Thanks, Mike!